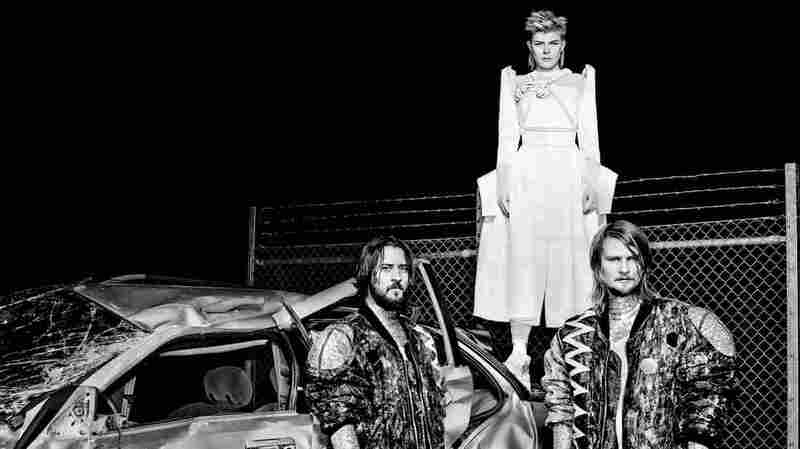 First Listen: Royksopp & Robyn, 'Do It Again' The Scandinavian dream team unveils a mini-album that bookends dance-pop goodness with moody grace. All the way through, there's a palpable sense of freedom to the music. Royksopp & Robyn's new mini-album, Do It Again, comes out May 26. Do It Again, by the Scandinavian dream team of Röyksopp and Robyn, is neither act's official "new album," but rather a five-song mini-album from the group Röyksopp & Robyn — which, truth be told, is a catchier name than Röykbyn or Robsopp. The set marks the next step in a friendly partnership that produced "The Girl and the Robot" from Röyksopp's Junior album and "None of Dem" from Robyn's Body Talk. Since it was created at a time when both acts were wrestling with the pressures of following up those albums, there's a palpable sense of freedom in Do It Again that reflects its origins: relaxed weekend recording sessions at Röyksopp's studio in Bergen, Norway. While a slumber-party vibe comes across in several of the songs, it's not entirely a hands-in-the-air affair. The 35-minute disc is bookended by two moody 10-minute tracks: the melancholy opener "Monument" and the closing instrumental, "Inside the Idle Hour Club." Both are relatively sparse, with slow tempos evoking gray skies and cold city settings. In between, though, there's plenty of dance-pop goodness. The disc shifts gears into the thumping house of "Sayit" — which also has an eye-bending, industrial-esque video directed by the Swedish design team Sandberg & Timonen — with its winking Kraftwerkisms and comical robotic come-ons. The euphoria peaks with the pulsating, exuberant title track (the one most reminiscent of Body Talk), with a thumping, dance-floor-filling beat and joyous synth washes that recall Calvin Harris, Tricky Stewart and The-Dream's work with Rihanna and Beyoncé. Then the mood downshifts into the bittersweet "Every Little Thing," which layers synthesizers and a gently pulsating beat to evoke heartbeats and conflicted emotions. Both acts are at work on their respective next albums — Röyksopp's, which will feature a revised version of "Monument," is due later this year, while Robyn's is TBD — but they'll take the party on the road all summer. Each act will have its own set, and then they'll team up.